Last month I told you that I had been working with a coach to help keep me moving forward with the business. It became clear that after 6 years of minimal creative changes to the producvts we have been making, it is time for me to start creating and formulating again. After all, this is what I love doing the most! 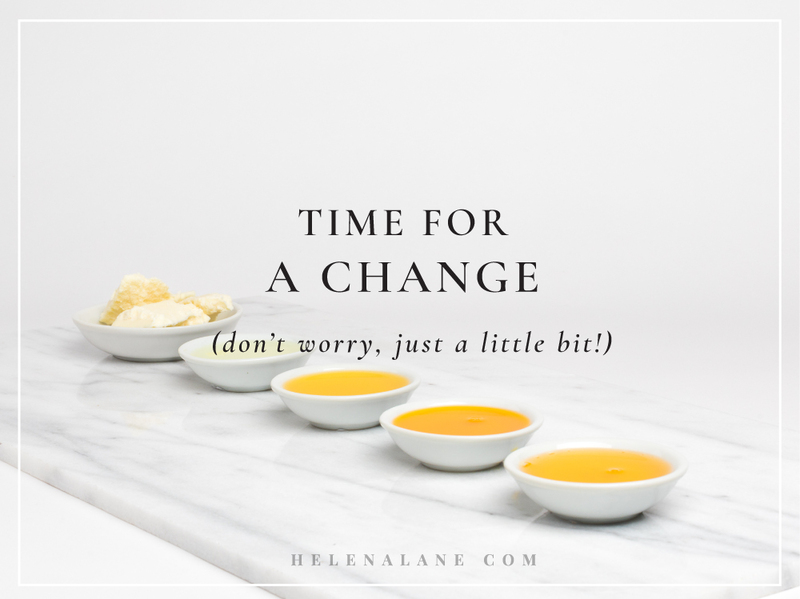 One of my core goals I created with her was to bring you all along for the journey that is Helena Lane Skincare. So rather than announcing a new line of products, I’m announcing the beginning of the creative process. Most of the products available today were created just over 6 years ago, and although the bulk of my experience (in years) was before that, I have learnt so much since then. Having my own products in the natural and organic skincare industry has taught me a lot, but not as much as the feedback from you, my customers. I can say, hand on heart, that I have read and taken on board all the feedback you have given me, and I will take all that with me into this next journey. Although I am incredibly excited to bring you some new products, I am also scared. We don’t like change and I am well aware that when someone has finally found the skincare products that “work” the last thing anyone wants is for them to be discontinued! I know this. I promise to keep this in my mind when formulating. I still stand by my philosophy of less is more, oil cleansing, and simple, organic formulations. I will not waver on that to become more mainstream, make more money or follow the trends. In fact, the changes will likely be simple in themselves. I will keep, unchanged the best-sellers (because that would be silly to change them). I’ll introduce new scents to the existing product categories. As I said my philosophy has not changed, so the product categories will remain (oil cleansers, flower waters, etc) but I’ll be bringing you some new scents and scent combinations that I love. I aim to (we’ll see how well I do on this one!) shrink the total number of products available. Choice is great, but with 25 products currently available too much choice can make it harder to choose. And there may be a new product or two… we’ll see! I am excited for what is to come and I promise to include you along the way. Looking forward to seeing the beautiful new products and scents you create! I am so excited for this, I have goosebumps and can’t wait to see what’s in store. How exciting ! LOVE your products but as a Vegan I would like to see a cleanser created without Beeswax. Look forward to following along with your new developments. A vegan cleanser is definitely coming! My absolute favourite scent is the lavender, lime, eucalyptus blend of the oil cleanser for acne prone skin. It’s become a huge point of self care for me. I’d love to know more about treating cystic acne. I’m excited to see what new things you create! Hi Jules, there is a blog post this month about treating cystic acne. Thank you for the review! I want products of lecithin emulsification. The cream emulsified with lecithin will soften as the skin becomes fluffy. I think that cream containing water by lecithin emulsification is very difficult. I’ve been using your products for 10 months now and I am SO happy with how my skin feels. I just want to say thank you! I am looking for products that take care of eye puffiness, wrinkles, and dark cycles. I found that skin in the eye areas are very delicate and sensitive. If you can introduce good eye skincare products with organic ingredients that will be awesome. Thank you! My moisturizers and water serums are safe and effective around the eye area, especially the rose ones!